'From Lord Admiral Sir Jerico Cortez, First Space Lord, Imperial Navy, Battlefleet Solar to Captain Thesus Vain. On this date, check zero, division two hundred and thirty six, year one ninety one, thirty first millenium. Sir: You are hereby directed and required to proceed aboard His Imperial Majesty's Starship Cleansing Light, IND-Five-Eight-One, there to take upon yourself the duties and responsibilities of Lord Captain in the service of the Golden Throne. You are directed and required to carry forth the torch of the God-Emperor of Mankind into the dark places and to act as Voice of the Emperor in the places where his light does not yet reach. Fail not in this charge at your peril. Welcome to the wiki for Fear No Evil, a roleplaying campaign using the 'Rogue Trader' product from Fantasy Flight games. 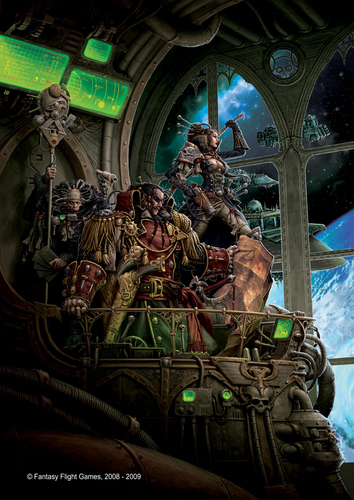 The game is set in the Warhammer 40,000 universe, in particular within the Koronus Expanse: an area of unexplored space beyond the light of the Imperium lying within the halo stars to the north of Segmentum Obscurus. It concerns the voyages of the imperial vessel Cleansing Light and the travails of her crew. The campaign began in 0046819M41, while the current date of the game is 0916820M41. The game currently runs bi-monthly on a Saturday, or whenever at least four of the players can get together for fun, adventure and profit! The game is open to anyone within the Edinburgh region (and perhaps further afield) who is known to one of the existing players - if you think this includes you, feel free to join the google group. Reference Note: Characters looking to join the game should see the character creation rules.